Episode 4 – George Lucas | Radio vs. the Martians! A podcast six months in the making! Mike and Casey reserve a booth in the Mos Eisley cantina with the composer of our show’s theme song, Todd Maxfield-Matsumoto, and Ryan Chaddock, creator of the Pantheon live action role-playing game, to talk about the filmmaker who has both attained geek sainthood, and reviled as one of its most controversial villains. 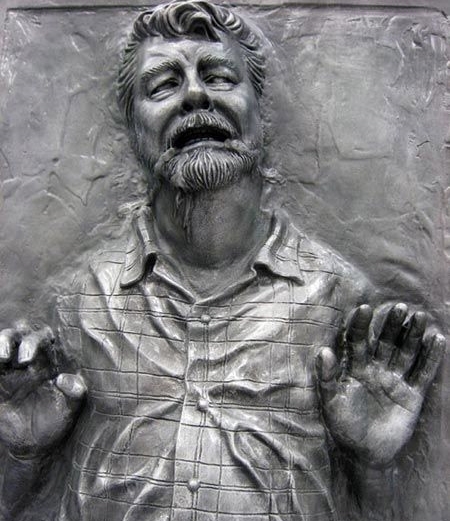 We’re talking about George Lucas, the man who gave us Star Wars… and then kept messing with it. We’ll explore the impact that Lucas’ work has had on our lives, and the post-prequel backlash that he’s still enduring, even more than a decade later. Does he deserve it? Did we over-react? Show us on the bantha doll where George Lucas touched your childhood! This entry was posted in New Episode and tagged george lucas, han shot first, howard the duck, indiana jones, panel, ryan chaddock, star wars, todd maxfield matsumoto by Mike Gillis. Bookmark the permalink. Thanks for the latest episode. I was worried going in, but I must say that, while I disagree with a lot of what was said, I felt the discussion was very even handed and fair. I can understand a lot of the reasons for the opinions given, even if I don’t share them. This was not, as I had feared, just another opportunity to bash George Lucas, which I’ve become very sick of over the last decade or more. Moreover, as with any in-depth discussion of someone as complex as Lucas and Star Wars, there were plenty of areas where we agree. I have a few comments on some of the points that were raised, but I’ll try to limit my feedback to things other than just pointing out where we disagree. Also, I apologise in advance for the length of this response, but I have a lot to say, so please bear with me! There was a comment early on about how Lucas, perhaps worrying about the popular reception of Star Wars after 16 years without any new films, was trying to please the crowds by giving them things like the pod racer scene, whereas he may have truly wanted something simpler and truer to the spirit of the original films. I’m not sure about the United States, but here in Britain at least, Star Wars was pretty well in vogue from around 1997 onwards, probably earlier. The trilogy had been re-released on video already and then the special editions came to cinemas in 1997, and all throughout this time (assuming memory doesn’t fail me), there had been a huge and growing toy line, which ran right into 1999 and the release of The Phantom Menace. So, while there had been a lull in the late 80’s and early 90’s perhaps, Star Wars had made its presence felt again by the mid 90’s certainly, and it’s never really faded since then. I’d be surprise if this were only true in Britain, so I can’t imagine that Lucas was worried that people had forgotten Star Wars by 1999. Moving on, an interesting point was made about how kids seem to prefer the prequels. I don’t have any kids and I have only limited contact with some of the much younger members of my family, so I had no idea of this, but I guess it explains why Darth Maul has become the face of the Star Wars toy market. I find it very interesting and I’ve often wondered if original trilogy only fans are perhaps looking at things through nostalgia glasses. I occupy a position that was not represented on the show myself. I’m not young enough for the prequels to have always been there, but neither am I old enough to have experienced any of the originals when they were brand new (I was born in 1986), so I was never caught up in the fervour of their original release. I liked Star Wars a lot, but perhaps not enough to get caught up in the hype of The Phantom Menace’s release. I got to see it that summer (twice, actually – giving it the honour of being the first film I ever saw more than once on the big screen) and I enjoyed it. I still enjoy it today, though I can accept it has flaws (the overuse of Jar Jar being first among them), but I was 13 when I first saw it. Maybe I’d have hated it if I’d been older, but maybe not. It is entirely possible that I’m looking back on it with nostalgia glasses; after all, it was the first time there was Star Wars that was truly part of my childhood, rather than being something that had just always been there. But even the 16 year old me enjoyed Attack of the Clones and the 19 year old me loved Revenge of the Sith. I still do and I’m not ashamed of the fact. After all, as Mike once said recently, part of being an adult is that you get to decide what you enjoy. Of course, even in my age bracket, I know well enough that I’m in a minority to avoid talking about Star Wars unless the present company can be trusted to tolerate a differing opinion. Sadly, that’s rare. Anyways, moving on again, I am in complete agreement about the final batch of changes added to the BluRay edition of the complete saga. While Ewoks blinking isn’t terribly offensive, I do object to adding Vader’s Big No to Return of the Jedi. I truly worry about the intelligence of any audiences that didn’t get that scene without it. Moreover, there was actually dialogue cut from The Empire Strikes back, which infuriated me – specifically Han’s line “he could use a good kiss!” when he storms off from Leia in Echo Base. I have no idea why this line was cut, but it’s one of my favourite in the whole film and ultimately made the decision for me that I would be trading in the BluRay edition as soon as I found a suitable replacement. I’ll get back to that. I really appreciated the discussion of Han shooting first. For a long time I tried to ignore this gross character assassination, but I finally had to concede that it did indeed make no sense at all for Han to let Greedo take the first shot. As you guys said, Han is a criminal; he’s a pirate, the kind of man who will kill in cold blood, especially when his own life is threatened. In the context of his character development, calmly shooting Greedo dead under the table and walking out like it was the most normal thing in the world makes perfect sense. I also agree that Jabba’s scene in A New Hope was completely superfluous; it’s kind of cool that it results in Boba Fett being in all three of the originals, but I think I preferred Jabba being a shadowy crime boss that we hear about a lot but only get to see in Return of the Jedi. However, I do think that Biggs meeting Luke on Yavin was a good inclusion, simply because it always struck me as odd that this guy Luke mentioned earlier in the film was suddenly one of his wingmen with no explanation. Finally, before I wrap this up, I think Mike probably has the most sensible attitude towards the prequels for someone who doesn’t like them – to just not watch them. Given that the originals were written long before the prequels, it’s questionable as to how much of the backstory Lucas actually had figured out back then, so I can think of much sillier things than pretending they simply didn’t happen. Moreover, I know how Mike feels. I felt the same way when I played Mass Effect 3 and watched in horror as a game franchise I’d grown to love more than any other was so mercilessly destroyed by bad writing and lazy game design. I got to a point where I sincerely believed I could never play Mass Effect again, knowing that it all lead up to that atrocious final instalment. It’s only in the last month or so that I’ve began to feel that I can still play and enjoy the first two games for what they are and just ignore the third one altogether; because they’re still amazing games and nothing can take that away from them or from me. But, again, I digress. This brings me to one last thing. I was surprised that Mike seemed unaware of the DVD limited edition version of the originals that was released a few years ago. These contained the 2004 edits of the originals on one disk, as well as the original theatrical versions on a second disk. Having traded in my BluRay complete saga, I was able to obtain these DVD’s second hand from a used electronics shop we have over here, CeX. I’m sure these must also have been released stateside, so I would strongly recommend looking out for them. Perhaps you can find them on eBay? In any case, if you can get hold of them, you won’t have to worry about your VCR exploding or eating the tape out of your old VHS copies, leaving you with no choice but to watch Han shoot first and step on Jabba’s tail ever again! Okay, I think that’s everything. Apologies once again for the length of this reply, and thank you once again for a fair discussion of George Lucas and Star Wars. We don’t agree on everything, but it is tremendously refreshing to finally hear some coolheaded discussion, rather than the usual Lucas-bashing diatribes that I’ve become so used to. Thank you, and I look forward to the next episode!